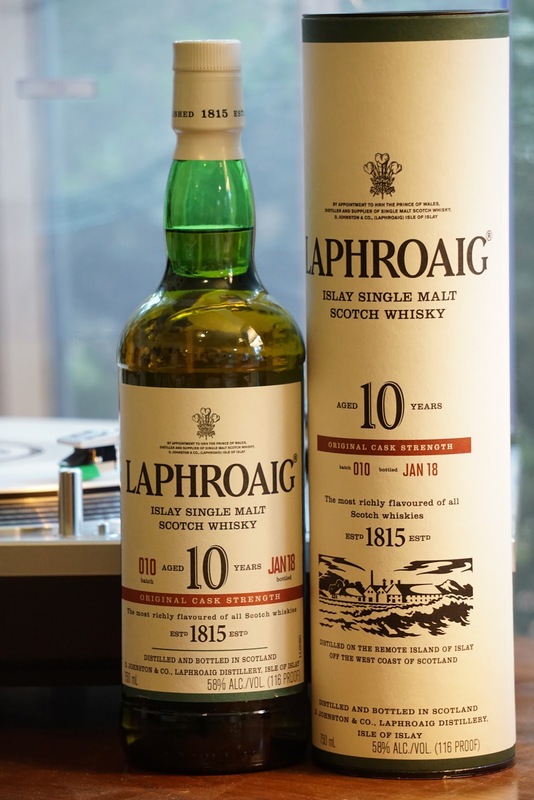 Laphroaig 10yo Cask Strength (58.0%): No need for an introductory paragraph this time. I have the latest batch of a true classic, Laphroaig 10 year old Cask Strength on my desk today. Color: Light amber, polished copper. Thin but very slow moving legs. Palate: A sweeter palate than the nose suggested: Ash, char and vanilla. Dandelion leaves and fresh thyme. Dried blood orange wedges, black peppercorns and sea salt. A few drops of water makes it easier to drink, maybe too easy... Incredibly vegetal now: Linden tea, bitter greens and grilled asparagus. Burnt beef tips and banana peppers on a grill. Finish: Long and very dry. Overall: In my opinion this release is one of the better CS batches, definitely the best one of last five years... It is beautifully vegetal and peppery. Yes, the peat, char and iodine are all there but this overall green quality creates a wonderful balance with all those peat driven qualities. It's ashy and bitter but also herbal and green at the same time. A very memorable whisky..! Glad that I have more than a bottle stocked already.